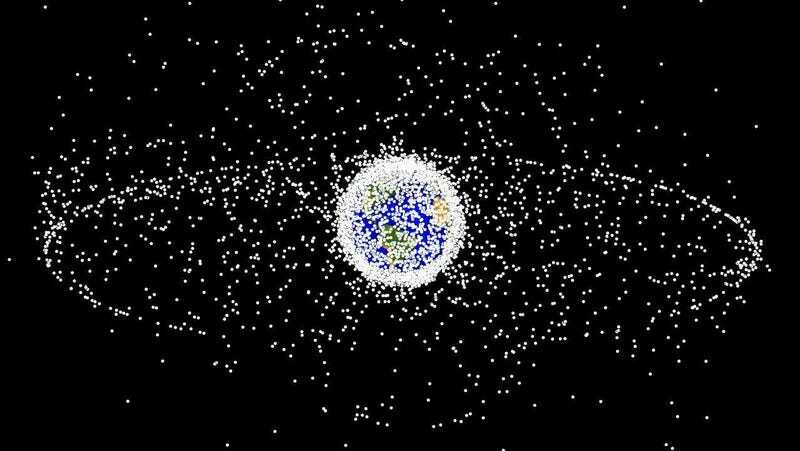 The earth's orbit is littered with about 20,000 pieces of space junk measuring four inches or larger. Pieces smaller than that are in the tens of millions, according to NASA. To prevent the Earth's atmosphere from becoming a full-on junkyard, Italian Space Agency scientists have proposed an elegant way to remove space debris: launch a satellite that seeks out the garbage, then using a robotic arm attaches a propellant to it. The propellant escorts the junk to the earth's atmosphere where it burns up. Sounds pretty neat, kind of like if Wall-E were a garbage collector when he propels himself through space with an aerosol can. The problem is the proposed technique is not so efficient. The Italian scientists report in the journal Acta Astronautica that one of their space junk collectors could take out five pieces of garbage per year. That means if space junk stopped proliferating now (although it's predicted to triple by 2030), the problem would be remedied in about 4,000 years. Scientists say space junk doesn't pose an immediate threat, but it could quickly become one. That's because of the Kessler syndrome: as space junk proliferates, so does the likelihood of collisions, which quickly multiply the amount of crap in orbit. Space junk instantaneously increased by 25 percent when China detonated a weather satellite in 2007. Just two years later, an American and Russian satellite collided in 2009, throwing even more debris into the mix. If this happens enough times, the earth's atmosphere could become impassable, making space travel impossible. Other proposed solutions to space junk include lasering threatening garbage out of the way or or employing service stations to lengthen the lifespans of existing satellites instead of launching new ones. But at a space conference in May, Gen. William Shelton, commander of the U.S. Air Force Space Command said there's no practical solution in sight for the space junk problem. Well, at least for the foreseeable future we can still look forward to fireballs of space junk falling from the sky.